According to reports, hotels belonging to the ruling TPLF/EPRDF Front and their affiliates have been destroyed by the protesters. Ethiopia Diaspora media outlets have reported that the Gonder Protest was sparked after the government started detaining members of the Welkait Amhara Identity Committee. At least four members of the Committee have reportedly been detained so far. Colonel Demeke is one among the few members, who have resisted detention and continued to fight with government forces. The Committee is composed of people, who advance the voice of Welkait people, who claim that they are members of the Amhara ethnic group, when the government and the Tigray Region Administration says they belong to Tigray region. The Committee members have represented the Welkait people officially at a national level attending meetings with government ministers. Diaspora based media outlets are reporting that at least 20 people have died so far since the Gonder Protest began. The Radio of the opposition Arebegnoch Ginbot 7 Movement reported few hours ago that the conflict has escalated and spread to smaller areas and districts of Gonder. The Radio reported that the Ethiopian government has used heavy weapons to disperse protesters. Several civilians including a five year old boy have been killed. Colonel Demeke Zewedu is reportedly engaged in an armed fight against the government forces. At least 13 armed government forces have killed today by the local people and several wounded, according to the Radio. Vehicles with government registration plate and two more Selam Buses, four military vehicles owned by the EFFORT business conglomerate of TPLF/EPRDF, have been burned down by the protesters; boutiques, shops and hotels including Florida and Atse Bakafa Hotels were also gutted by fire, the Radio reported. 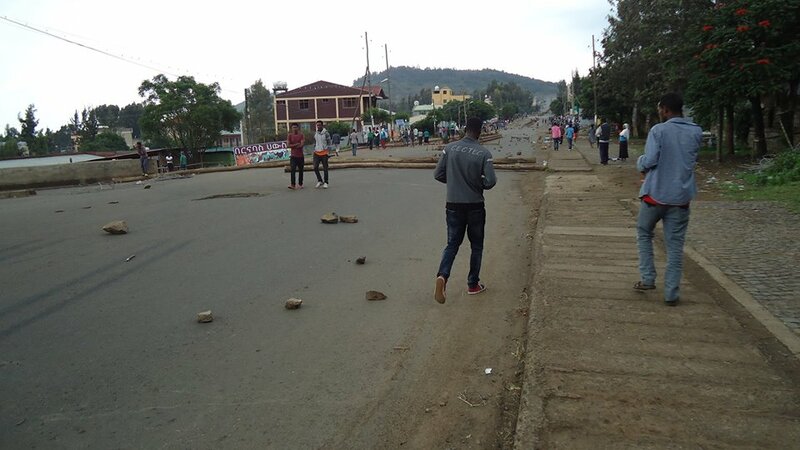 The protest today had a violent nature compared to yesterday around the City Centre of Gonder and towns. The protesters are demanding the release of the Welkait Amhara Identity Committee members that are detained by government securities.